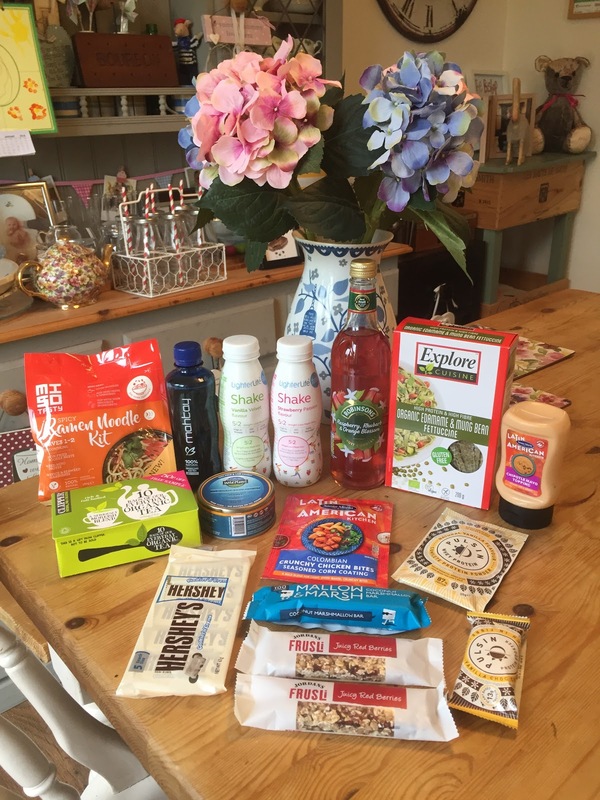 Mrs Bishop's Bakes and Banter: What was in our January Degustabox? 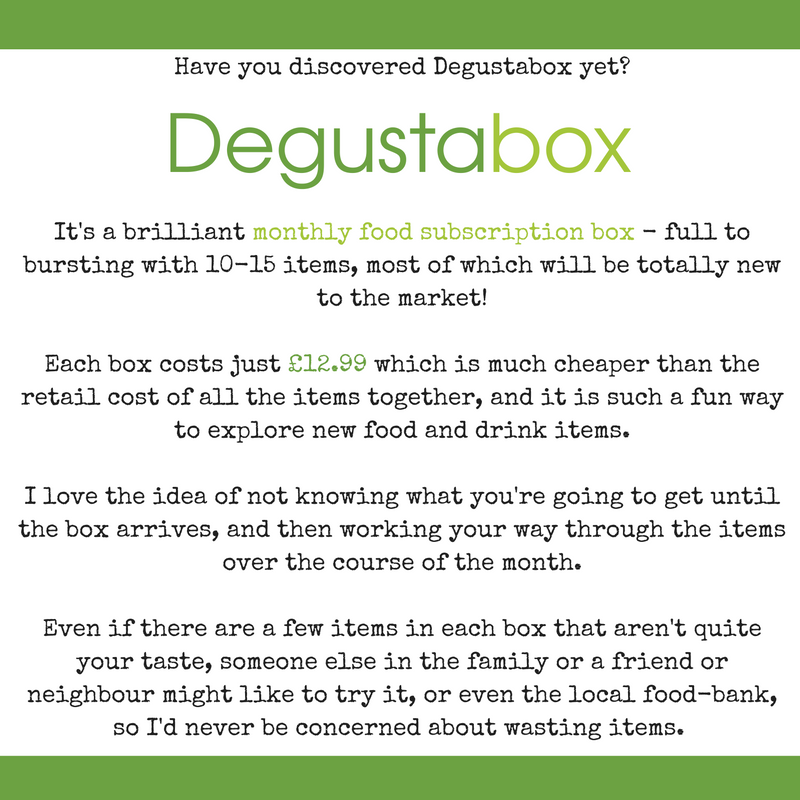 It's time to share the contents of our January Degustabox. There were lots of great goodies in this month's box - plus some introductions to some new-to-me brands that I'll be looking out for in the future. 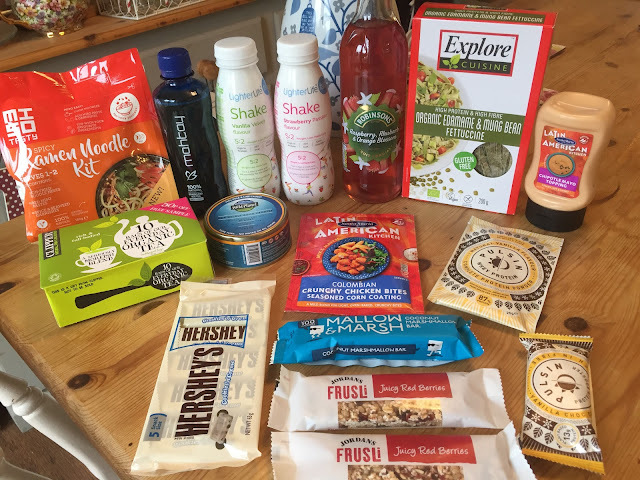 The theme of the box was 'NEW YEAR, NEW ME' which however unoriginal, was a great selection of healthier goodies to enjoy after an indulgent December. So I was pleased, as I've been trying hard all month to be sensible and make mostly healthy choices. FROM THE BRAND: Mahtay is a lightly sparkling drink that was designed with today's busy, health-conscious lifestyle in mind. It blends the ancient energy-giving properties of South American Yerba Mate with coconut water and açai berries to deliver refreshing taste, natural energy and supportive health benefits in every drop. WHAT WE THOUGHT: Liam absolutely detested this drink, but I couldn't decide what I thought. I *THINK* I liked it - it was an odd taste, but there was something about it that meant I couldn't stop taking another sip. It definitely has an ice-tea vibe, and it smells of biscuits! FROM THE BRAND: Looking for a scrumptious bar with a boost of protein? Then snack a Pulsin Vanilla Choc Chip Protein Booster! With a cookie dough taste and texture, plenty of diary free choc chips and packing 13g of plant based protein it's a healthy and filling snack. WHAT I THOUGHT: Oh my goodness, this was by far my favourite product out of this month's box. Not only did it taste like a really naughty treat, but it was SO FILLING! I ate it for my mid-morning snack and wasn't hungry for lunch until 2pm!! I'll definitely be buying these again, and I'd probably just eat half as a portion next time. YUMMY! FROM THE BRAND: The diet that works around you! 2 days each week replace all of your meals with 4 LighterLife Fast products (available exclusively from Superdrug). These delicious ready to drink shakes can be enjoyed as part of the Fast plan, as a quick protein hit or meal replacement. 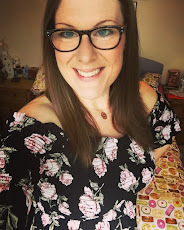 WHAT I THOUGHT: As many of my blog readers will know I am not a believer in meal-replacement diets, they are just not my cup of tea at all. However, I am realistic about my busy lifestyle and I know there are just some days when I have way too much on my plate, and I won't give myself the time to prepare a balanced meal (this is usually breakfast or lunch) sometimes, you just need something speedy and satisfying - if you don't have something healthy and balanced to hand then this is the time you'll most likely opt for junk, so shakes like these are quite handy to keep in the fridge for such meal-related-emergencies. Actually, I surprisingly enjoyed these shakes - they have nice flavours (although still have a vitamin-like after taste) and they are very filling. FROM THE BRAND: A beautifully rich, full-bodied black tea blend from some of the world's finest organic tea gardens. All our organic products are grown in a way that preserves the natural balance of the environment and we were the first tea company to used unbleached tea bags! Clipper products are made with pure, natural ingredients and a clear conscience. WHAT I THOUGHT: What a lovely cuppa! I've had Clipper Tea before usually when out in cafes/coffee shops, and I've always enjoyed it, so it was a nice treat to have a little stash of bags for drinking at home. FROM THE BRAND: The NEW Vanilla Whey Protein powder is rich in essential amino acids and high in calcium which is vital for muscles and bones. With 22g of protein per 25g serving, the natural powder is vegetarian, low fat, made using hormone-free milk from UK grass-fed cows and has no added sugar. WHAT I THOUGHT: Protein powder is a great product to have stashed in the cupboard if you're serious about health, fitness and working out. I work out twice a week in the gym, and after a particularly heavy session I like to have a protein shake straight after my workout to help repair and rebuild muscles - protein shakes being particularly great at this due to their compact nutrition (isolated nutrition source) and relatively few calories. On top of that protein shakes only take about 30 minutes to reach the muscle after ingestion, which makes them super effective. Finding a protein powder that is right for you is hard, I often don't like the flavour or after taste they give, but this one was very vanillaery and super tasty! I liked the consistency is produced when mixed with a banana and my favourite oat milk. FROM THE BRAND: Explore Cuisine's Edamame & Mung Bean Fettuccine is great in taste and texture and provides a high amount of plant based protein and fibre per serving with the lowest level of carbohydrates, 22g of protein per 50g serving, almost 3x more than regular pasta. WHAT I THOUGHT: I'm yet to try this, but in theory I love the sound of it! Excited to try this soon for a speedy lunch or dinner. FROM THE BRAND: A coconut marshmallow bar that 100% melt in your mouth gooey deliciousness. These Mallow & Marsh bars are handmade in England using only natural ingredients and they are under 100 calories each. 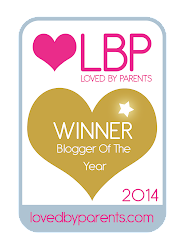 WHAT I THOUGHT: I've enjoyed Mallow & Marsh bars on many occasions, I'm a big fan! When you want a sweet-treat without too much calorific impact these are perfect. I especially liked this coconut flavour. *This product wasn't included in every box, you either got a Mallow & Marsh Bar, the Ramen Noodle Kit OR Tabasco Sauce. FROM THE BRAND: Creamy, hot & smoky. The Chipotle Mayo Topping makes a great addition to any of our Latin American Kitchen range. WHAT I THOUGHT: We used this gorgeous spicy and super creamy mayo to top our homemade 'fakeaway' Lamb Doner Kebab meal last night (recipe from celebrity chef Tom Kerridge's BBC programmed 'How To Lose Weight For Good') It was the perfect condiment for this meal - added much needed spice, but also acting as a dressing for the salad aspect of the meal. 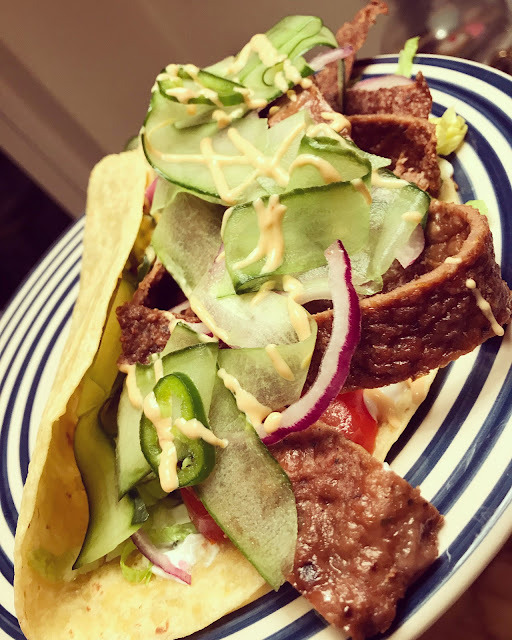 'Fakeaway' Homemade Lamb Doner Kebab with Chipotle Mayo Topping. FROM THE BRAND: Robinsons most sophisticated squash yet. New, Robinsons Fruit Cordials is a sophisticated twist to squash with combinations of real fruit and botanical flavours. Contained in a glass bottle, Fruit Cordial is a new more concentrated way to bring a burst of Robinsons' flavour to the dinner table. WHAT I THOUGHT: I'm not much of a squash drinker, but I tried this and was pleasantly surprised, it definitely has a much more sophisticated taste, and would also make a lovely flavour addition to a gin and tonic, which is next on my list to try! FROM THE BRAND: Ranked #1 in the US by Greenpeace for sustainability, these Albacore Wild Tuna Steaks - No Salt Added are 100% pole and line caught. Cooked once to retain the natural juices in the can. Please don't drain! Mix the Omega 3-rich juices into the tuna for added flavour and nutrition. WHAT I THOUGHT: I'm yet to try this, but I regularly enjoy tuna as part of my diet, and always try to buy a sustainable and fair product, so I will enjoy trying this next time I cook with tuna. FROM THE BRAND: A mild blend for light, oven-baked, crunchy bites. Use our simple blend to make delicious Columbian-inspired crunchy chicken bites in your oven. We use corn, instead of wheat, to get that extra crispiness which is loved by adults and kids alike, making it perfect for a family night in. WHAT WE THOUGHT: I've just done our meal-plan for this week and we'll be putting this mix to the test then. We are all big fans of 'nursery food' style comfort-food dinners such as homemade chicken nuggets, so I'm confident this will go down well. 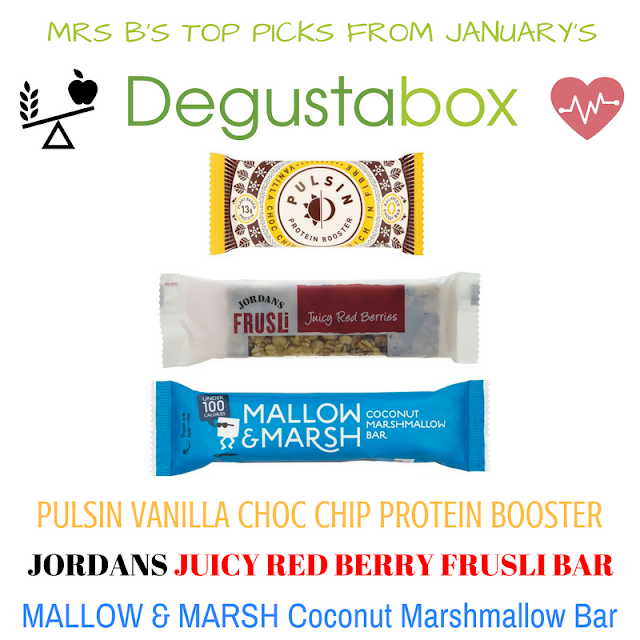 FROM THE BRAND: Jordans Juicy Red Berries Frusli Bar: handfuls of zingy cranberries and raisins, all mixed up with British wholegrain oaty awesomeness. WHAT I THOUGHT: I ate one of these bars about 20 minutes after my box arrived! Haha! 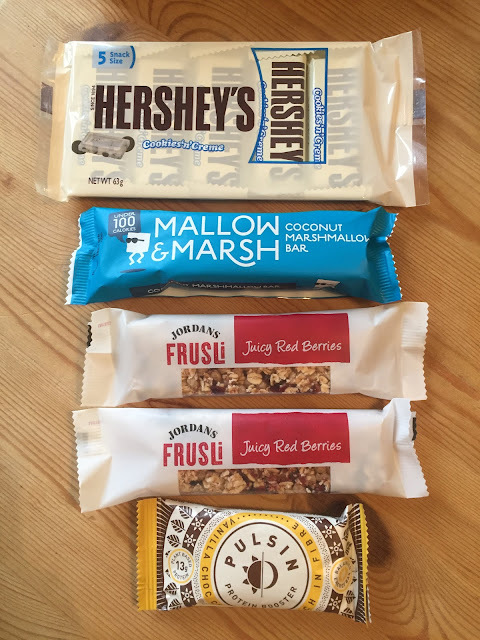 I adore these style of energy/cereal bars and the box arrived during my usual morning snack window, so who was I to resist? Having lived in Bedfordshire for over 12 years now, Jordans has become a brand I've gotten to know very well - born from Jordans Historic Mill* which is just down the road from us, the products are fab - this bar not excluded. *Jordans Historic Mill visitor centre celebrates Bedfordshire's role in food production - if you're local or visiting Bedfordshire why not pop down for a visit where you can take a tour around the mill, and then relax overlooking the beautiful gardens whilst trying out their delicious locally sourced food in their amazing cafe. FROM THE BRAND: HERSHEYS Cookies 'n' Creme Candy bars are a unique twist on a classic flavour combination. Enjoy crunchy chocolate cookies and smooth white creme in each delicious bite. WHAT WE THOUGHT: Needless to say, Liam and I barely got a look in with these bars. 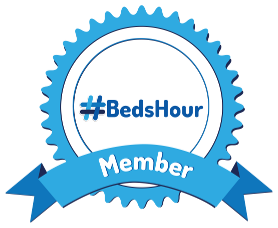 They went straight into our 'Shameless Bribes For Children' tin & both Bert and Connie have enjoyed them over the past few weeks. I did get a little bite of one, and can confirm that are DELICIOUS. I loved the size, making them perfect for little tummies, or fo adults trying to enjoy a moderate treat. FROM THE BRAND: Miso Tasty Spicy Ramen Noodle Kits are perfect for tasty and easy mealtimes. Our noodles are accompanied by our signature miso soup base plus a seaweed garnish for an authentic experience. This spicy flavour provides a warming, healthy base for a quick noodle meal - simply add your own toppings! WHAT WE THOUGHT: Another product I'm excited to try - again, on our meal-plan for next week. Liam and I have both enjoyed Ramen dishes at Wagamama restaurants, but we've never made one at home, so I'm intrigued to see how it turns out. 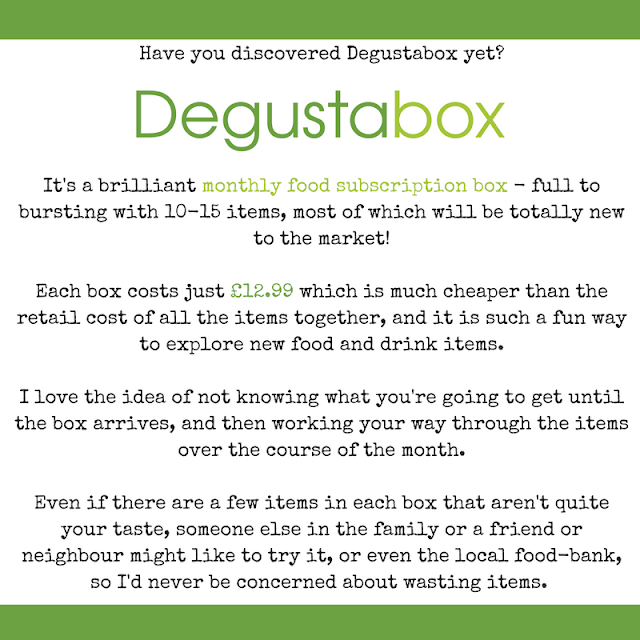 We were sent this month's Degustabox in exchange for our honest opinion of its contents.